Happy Spring! Spring is definitely my favorite season! The weather is absolutely perfect because you have your warm sunny days you can spend by the pool with some colder rainy days sprinkled in as well! I love the anticipation of summer AND my birthday is this month so of course I love spring time! The past couple of months have been kind of crazy. Matthew turned three in March and let me tell you, I have a full on threenager now. Matthew never went through a terrible two’s stage like everyone always warns you about. For the most part he was a little angel, but once his third birthday started approaching, someone replaced my angel with a little gremlin! He has been keeping me VERY busy and to make things better he’s also been battling a cold since like Christmas!! For anyone who doesn’t know, I am currently studying interior design through an online course. I’ve been trying to breeze through that as quickly as possible, but the gremlin usually has other plans in mind whenever I whip out my computer to get some work done! Pretty much all of my free time has been taken up by school and working out! As you probably know, I have been extra into health and fitness recently! I love going to the gym not only for the health benefits, but the time to myself it allows me. For any mama struggling to find the time to work out, join a gym that offers child care!! Seriously, this has been such a game changer for me! You can drop off your kid and while they play with other little kids you get to focus on and take care of yourself for a little bit! Trust me mama, you deserve it!! 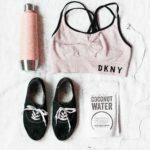 While March was kind of a crazy month, I made note of things I was loving from health to beauty to fashion! My sister gifted this pallet to me for Christmas and omg it’s the best thing ever! 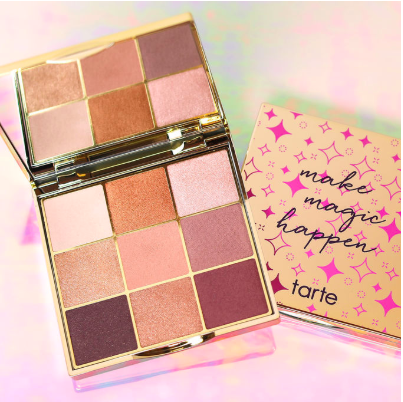 The colors are so beautiful and natural so they’re super easy to work with even if you aren’t the best at applying makeup. They go on so smooth and I never have a problem with creasing! This is seriously the only eyeshadow pallet I have used since I received it! I almost always paint my own nails now. Not only do I just find it really therapeutic, but it’s also a super easy way to save some money! I love changing up my nail color pretty regularly and trying out new colors. 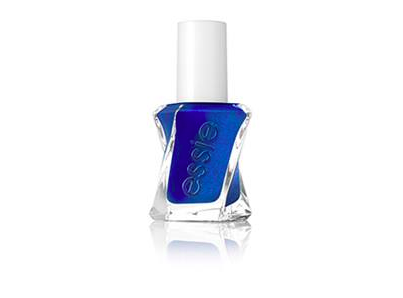 I love Essie’s gel nail polish line because it lasts so much longer and the brush is thicker and wider than the typical nail polish brush which makes it super easy to apply! I love this particular color because it’s a little unexpected. I think this shade of blue is very modern yet still chic and sophisticated while the slight sheen keeps it very fun and youthful! The “dad shoe” trend has been around for a few months now and it is still going strong into spring and summer. I’m obsessed with chunky shoes in general. I think they make any outfit instantly look so much cooler! They can be worn with jeans or skirts and dresses and it always looks so hip! 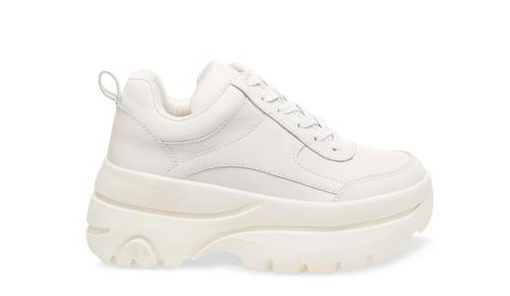 I personally love white chunky sneakers because I think it’s a little more wearable for every day looks! It just adds so much more dimension to an outfit and that extra oomph to make an outfit look super cool and trendy! I personally got mine from Topshop, but since I couldn’t find them online I know a lot of people love the ones from Target or Steve Madden. You guys already know about my obsession with leggings from the Joy Lab brand at Target, but I decided it was time for me to branch out and try other leggings as well. I love good quality leggings for a reasonable price so I figured I should try out Fabletics! I was not disappointed! There are so many different styles for different activities and body types. Being the taller girl I am I really appreciate the option for which length you want whether that be short, normal, or tall! Ah! So perf! 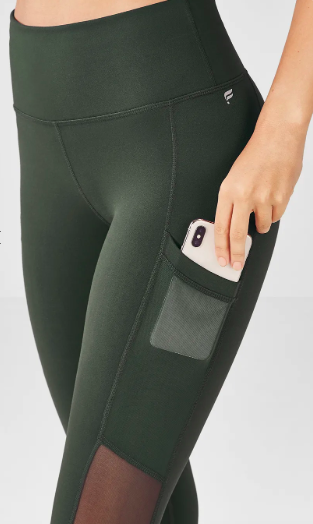 I love the Mila Pocket Capris because the mesh is super flattering and the pocket is so helpful for holding your phone or keys while you’re at the gym! I also love the High- Waisted Powerholds. They are all so soft and comfortable, but hold you in really nicely as well! If you join the VIP membership you can get all items at a discounted price and you are not obligated to a monthly payment! I am always looking for snacks that are quick, easy, and high in protein. I love protein shakes for after workouts, on the go, or just to add in with a snack. 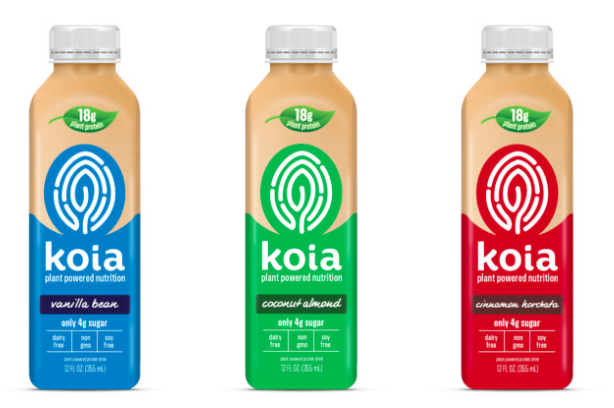 To be honest, sometimes I am just too lazy to make my own protein smoothies or even just shake up some protein powder in water so these Koia protein drinks are perfect! They’re vegan and contain 18g of protein and only 4g of sugar! They also have so many different yummy flavors like Cake Batter and Cinnamon Horchata! //What products were you loving in March?// Let me know in the comments below!